Saturday's Irish Independent reported that many Irish people are turning off the heat and shivering in their homes thanks to the cost of natural gas in Ireland. 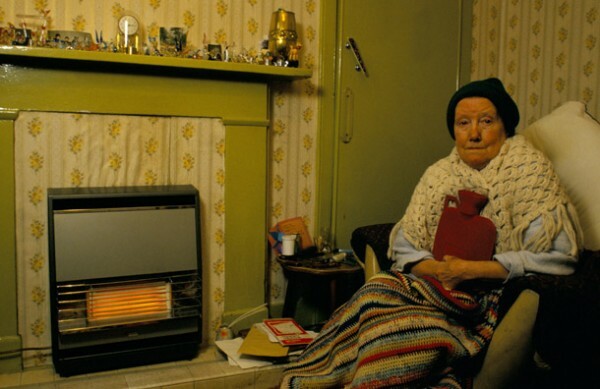 Frozen Irish people is a result of a combination of the collapse in the Irish economy and the doubling in the residential price of natural gas over the last 7 years. The real kicker here is that for the most part Irish people have no one to blame but ourselves. In order to ensure that natural gas is as expensive as possible we have added taxes onto the price of gas and worked tirelessly to stymie any attempt at increasing production of natural gas in Ireland. The additional "carbon tax" was added a few years ago. The purpose of this tax was two-fold: (1) to provide subsidies for the wind energy production boondoggle err, industry and (2) to encourage Irish people to simply use less gas - that is, they want us to heat our homes less and cook less. At the time the carbon tax was imposed on us the Irish government was a coalition of a big party - Fianna Fáil - and a small party - the Green Party. The carbon tax was a case of the Green Party tail wagging the Fianna Fáil dog. Yet, even after we threw them out of office and obliterated the Greens' political representation the new government didn't have the courage to reverse the "carbon tax." The carbon tax is frustrating, but not as frustrating as what's going on with the production of natural gas. It's becoming increasingly clear that the seabeds around Ireland are rich in oil and natural gas, especially natural gas. Yet we have been unable to properly exploit this resource thanks to small groups of protesters holding up production. It's the same with the gas held deep beneath the rocks in Ireland. The process to free that gas and bring it to the surface so that it can be distributed to the homes and schools and businesses of Ireland is called hydraulic fracturing, or fracking. The introduction of fracking is the source of America's energy revolution, which has seen prices of natural gas fall sharply and will lead America to energy independence. Fracking could well work a similar miracle in Ireland, but we lack the political will to ensure that local concerns are allayed and trouble-making environmentalists* are sidelined. We can't even import cheap natural gas from America thanks to the ridiculous regulatory situation. Hess Corporation and other partners want to import liquefied natural gas from America to a new facility in Kerry, but despite getting approval from the planners in 2007 the facility is still mired in red tape and may remain so through 2014. So for the foreseeable future Ireland will be denied cheap natural gas, whether Irish or imported from America. The carbon tax, however, will remain as a daily kick in the head, an additional extra cost on top of our exorbitantly expensive natural gas. The Irish government's position remains "keep shivering." We vote for them, though, so we have only oursevles to blame. * The ability of environmentalist protesters to stifle this industry actually makes me wonder if we'll ever see the oil coming ashore in Cork.